Admit it: you need a vacation! Every Mom needs a vacation, but most of us just can’t imagine how we can take one. Traveling with kids means theme parks, stress, and no romance. Doesn’t it? The answer is cruising! Mommy Cruises shows you how every Mom can take a relaxing vacation, enjoy time with the kids, and still find time for romantic interludes. 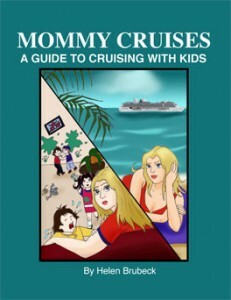 Inside this book you’ll find all of the information you need to start planning your first cruise vacation, written from a Mom’s point of view. But be warned: once you start cruising, you may become addicted! Helen Brubeck is a veteran cruiser who has traveled with her children many times, and lived to tell the tale. Find out her secrets in Mommy Cruises! Use the button below to purchase a copy from Amazon.com. What Can I Do on a Cruise? What Can Kids Do On A Cruise? What if I Have a Large Family (more than 4 people)? What Can We Do In A Port?